As usual, a little balance is needed, so we'll swing to the opposite side of the political compass with a comment by EID. The thing that struck me immediately watching this short was the apparent lack of any kind of geologist or drilling expert. The film shows papers from the standard literature that we work with everyday, but apparently he couldn't get comments from anyone? I find that surprisingly lazy if anything, because given enough beer you can usually get a geologist to come up with some kind of contrarian opinion about something. So why couldn't Josh get any geologists on film? The other really noticeable thing is that the line of attack has completely shifted from fracking to well completion activities. I can only assume that this is a tactical retreat, a tacit acceptance that the fractures created during fracking are demonstrably too small and too deep to have any kind of influence of shallow aquifers. And if fracking is not the problem, then the only other source of leakage must be from the well bores. Josh is right that well bores can fail. But this is a problem that we know lots about, because it's a problem in conventional gas drilling as much as it is for shale gas. So the question changes, from are you ok with having fracking going on in your back yard (and fracking sounds scary, new, dangerous) to are you ok with any gas well (conventional or shale gas) in your back yard? Which generally elicits a quite different response, because conventional gas is something people have more faith in, simply because it's been around for ages without causing many problems. For instance, Western Europe's largest onshore oil and gas field, Wytch Farm, is sited under some of the most prized and expensive real estate in the country, and noone seems bothered by it. Casing failure and leakage rates at almost 50%? Seriously? I think if we had problems in conventional gas fields on this scale, we'd really know about it? We've drilled millions of gas wells across the planet - if 50% of them had failed, we'd have contamination everywhere, most of the time. The problem stems from cherry-picking - there are plenty of reports out there that show well failure rates at 0.01%. Because the debate over shale gas has become so polarised, these numbers don't get a look in here. But it'd have been nice for Josh to at least to have gotten some geological expertise onto film to help him go through the figures. Finally, even if failure rates were below 1%, doesn't that still sound pretty risky? Well, if well failure was a done deal "that's it, nothing we can do now" type thing, then maybe. But well casing failure is easy to detect - before you being production you run a tool down the well that detects failure. If there is failure, you do a workover to correct the damaged section. All you need to have is regulation that requires companies to do this. It'll cost them more money, and so they'll probably have a moan, but that's the kind of thing we mean when we talk about having a strong regulatory regime for shale gas extraction in the UK. Sorry Mr Company person, get that cement log running before you even think about producing from that well! If Josh Fox is cherry-picking his data, he can at least be given credit for providing clear references. Can you provide any further details on the "plenty of reports" that show well failure rates at 0.01%? And given that the 46% figures for the Gulf of Mexico quoted in the film do check out, why would the variation be so high? In Ohio the rate is 184 incidents from 33,000 wells drilled. But that includes all oil and gas activities (so includes things like surface spills and the like). Broken down further, only 12 were due to casing failure - so a rate of 0.04%. It should also be mentioned that the majority of these occurred in the 80s and early 90s, prior to more modern techniques and regulations. 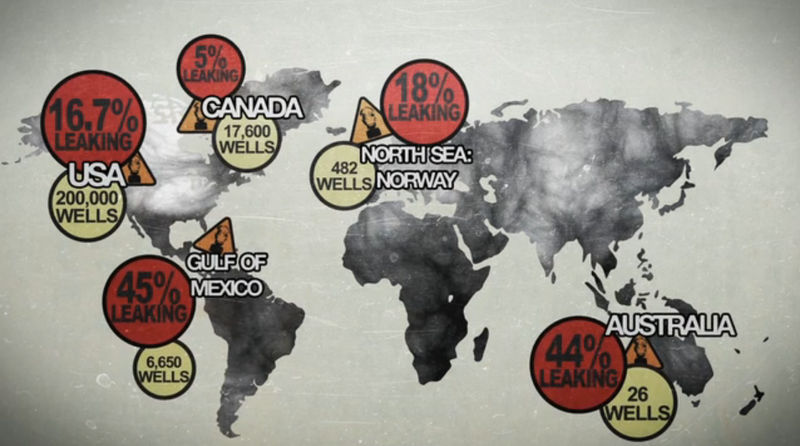 Similarly, in Texas, 190,000 wells drilled, a total of 211 incidents, of which 21 were casing-related. So a rate of 0.01%. As far as I'm aware, the powerpoint slides presented by Fox Gulf of Mexico, from a company selling well-bore integrity solutions, so always likely to over-egg the impacts to sell their product. The 46% figure is a rate of incidences of pressure increases in the well-bore annulus, which does not equate to well-bore failure and leakage, although is 'can', but necessarily, be a precursor to a problem.